As you can guess, the numbers to the right belong to Wawrinka, who had to have one of the most miserable returning performances in recent times. Stan managed to win fewer than one point per return game played (7 points won in 9 return games), pushed Nadal to deuce just once on the Spaniard’s serve, and never created a single break point. Rafael Nadal had probably one of the easiest serving afternoons of his entire comeback. Still, as the greatest clay courter of all time collected his 23rd Masters 1000 title (as always with Nadal’s milestones, stop and think about just how crazy that number is, and then remember that he’ll be turning 27 in a month. He could get to 30 if the knees allow), I was wondering how this serving dominance translated into a Key Points (Game Points, Break Points, Set Points, and Match Points) Analysis. Once I tallied the Key Points of the match and I took a look at the numbers, this thought came to mind: this 6-2, 6-4 beatdown could’ve been worse. More than 1 out of every 3 Key Points in this match was a Break Point played on Wawrinka’s serve . In fact, 9 of those Break Points came in just two service games: the opening game of the match and then the 2-all game in the second set. Nadal came out with the break in that opener, but Stan did survive his second 0-40 hole of the match. Still, it’s crazy to think that 37% of all Key Points during a Masters 1000 final were Break Points in Rafael Nadal’s favor. That’s an extraordinarily high number. As a bit of trivia, Stan Wawrinka’s first game point came in his third service game of the match, when he was already down 0-4 in the first set. Looking deeper into those 8 break points Wawrinka saved, we see that 5 came via Nadal unforced errors (all forehand unforced errors, too). Stan was getting bailed out by the eventual champion, which is not all that common. However, Stan had to feel a little uncomfortable with all that generosity, because in an act of damaging reciprocity, Stan did give away two breaks of serve via double-faults (anecdotally, both 2nd serves that landed out were almost identical). 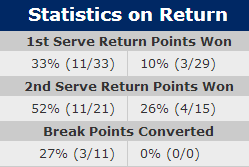 – All 3 Key Points won by Stan on Nadal’s serve came in the same game (1-2 in the second set). – Rafael Nadal was up 40-0 at the time, and proceeded to give away the next two points via unforced errors. It was easily Nadal’s poorest service game of the match. – At Deuce in that game, Stan had not one, but two, good looks at backhand passing shots. He hit the first straight at Nadal, who responded by giving Stan another chance to pass him. The opportunity went begging, as Stan blasted a backhand pass well long. Moments later, Nadal held and the very small window of opportunity that had opened for the Swiss had disappeared, never to return. 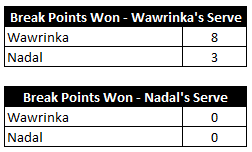 Here’s a very strange bit of trivia: for the second final in a row in which Rafael Nadal is one of the participants, his opponent opens the match by winning the first 5 Key Points, followed by Nadal winning the next 5. That’s exactly what happened in the Barcelona final. Huge difference, though: Almagro’s hot streak resulted in a 3-0, two-break lead. Stan’s 5 Key Point winning-streak merely delayed the inevitable early break. And after Nadal won the next five Key Points (exactly like in Barcelona), it was the Spaniard who had a commanding 4-0, double-break lead. Tennis is a strange sport, indeed. – Nadal had one more Winner/Ace than Stan, and his distribution was rather nice: 3 forehand winners (2 cross-court, 1 inside-in), two Aces (surprise, surprise, both were up the T from the AD court) and one backhand winner. – All of Stan’s winners were either forehand winners or Aces. – Even though Stan only gave away 4 Key Points via unforced errors, half of those were due to double-faults. And both doubles handed over breaks of serve. Never a good thing. 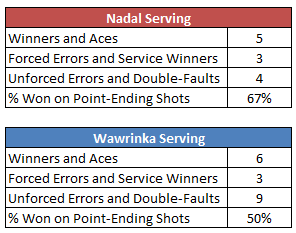 – It’s rather interesting that there were only 2 Service Winners and 4 Forced Errors during the entire match. Both men split them evenly. – Nadal clearly won the “battle” of the Key Points Given Away via unforced errors, 9 to 4. Six of those were forehand unforced errors (three were cross-court, two were inside-out, one was inside-in). Stan Wawrinka played 4 horrible service games (he was down 0-40 twice and 15-40 twice), and survived only one of them. The newest member of the ATP top 10 never found a way to get into Nadal’s service games, and the one time he was basically invited in, he wasted his half-chance. Which is to say, Wawrinka was far away from making this final a competitive affair. This match also illustrated why Nadal has won all 19 sets of tennis he’s played against Switzerland’s second best player: the 23-time Masters 1000 champ finds it very easy to hold serve, and when a rally starts, he also finds easy ways to outmaneuver Wawrinka (Nadal ended up winning 12 more baseline points). Even if Nadal is below his best, this is too big of a mismatch for Stan to overcome. Particularly on a clay court. As for Nadal, he’ll be delighted at having survived a very hairy situation against David Ferrer (the Valencia man was a simple put-away forehand away from having two match points) in the quarters, and playing his best tennis of the week in the last two rounds of the event. Rafael has never been a fan of playing at altitude before the French Open, but that discomfort is easier to take when you walk away from the event as the champion. Rome will be a fascinating encounter, since a potential Djokovic-Nadal semifinal looms large. That event should tell us a lot more about the current state of the two huge favorites for the French Open crown.